Hemisphere Design & Manufacturing builds world class store fixtures and displays. From the biggest flagship space, to the smallest counter top we’d love to help you bring your ideas to life. Below is a sampling of the verticals we work within. Hemisphere can provide your brand turn-key store fixture and millwork packages for national and international rollouts. We can handle all necessities from the front windows all the way to the stock room… Let us know how we can help! Hemisphere is your “can do anything” partner focusing on bringing your ideas to life. 1000+ door roll-out? No problem. Big box retail end cap, inline or island? Absolutely. We can help tell your brand’s story and engage with consumers in a meaningful way for a regional push, or a worldwide deployment. Hemisphere has helped our customers build engaging retail spaces ranging from one-off retail windows to shop-in-shops to full retail build-outs. We’re well versed in working with all materials and finish levels for wood, metal, plastic, and glass. Don’t need our full design and engineering services? Hemisphere offers the ability to tap into our extensive domestic and overseas manufacturing network to help keep you focused on what you do best, make your brand impactful while keeping your implementation costs down. … and what continues to set us apart. Hemisphere was founded on the principle that there is a better way to attack retail. As a brand (new to the marketplace or the perennial rock-star), it is imperative that your retail execution supply chain be continuously adapting to the competitive retail sector’s ever evolving needs. Your brand must have a partner with the foresight to identify retail trends and a team who can perpetually execute upon them. Instead of doubling down on the status quo, Hemisphere has chosen to move in lock step with the marketplace. Utilizing a tactical group of the best retail implementation minds, we can be as nimble as your brand execution requires. We aren’t bound by industry rules, because we make our own rules. Stop being beholden to the “this is the way it’s always been done” culture of our competitors. Incorporating state of the art ERP/MRP platforms, we maximize the amount of information available to our clients at any given moment. The most up to date renderings, engineering, production progression photos, and logistics schedules are available to our client partners with a click of a mouse or a tap of a finger.. 24/7/365. Let our laser-focused group of Project Managers, Engineers, and Fabricators help you do things that other companies can’t, while ensuring you execute on the sales lift goals you’ve been tasked with achieving. We’ll make your brand (and you) look good. We Promise. Hemisphere is a full service creative execution and production firm. Backed by group of people who are the best at what they do and buildings full of equipment that WE own, we’ve put our money where our mouth is when it comes to servicing our clients. Leveraging our know-how and state of the art facilities, Hemisphere will see to it that your brand’s concepts seamlessly migrate from napkin sketch to sales conversion in-store. With Hemisphere controlling the manufacturing it means you’ll always be paying “factory-direct” prices (a statement that shockingly few of our contemporaries can make). When was the last time you visited your suppliers’s manufacturing facilities and their name was on the door? Hemisphere can take implementation from concept ideation all the way through international distribution and installation. Its not uncommon for our clients to have their own internal creative staff. We’re equally happy to work shoulder-to-shoulder as consultants to your internal team during initial phases or as your Phase II Team, picking up the conceptual work after internal buy-in and making it “retail-ready”. Regardless of our integration into your process, we’ll always work in with your internal resources to ensure everything is executed is to your brand’s exacting standards. If you want it done right you have to do it yourself. Hence Hemisphere’s deep roster of manufacturing equipment. By cutting out a layer of external suppliers we’ve cut out a layer of potential issues; ensuring our clients get exactly what they are expecting, when they’re expecting it, every time. Types of machinery you’ll find at Hemisphere: CNC Routers for wood and plastic, fiber and CO2 lasers for steel and plastics, press brakes, pem setters, a fully equipped cabinet shop, edge finishers, heat bending tables, vinyl cutting, roll-to-roll printers… you name it, we’ve got it. Our international procurement experts average over 15 years of experience in Europe, Asia, and Mexico sourcing. Teaming ONLY with factories that have been visited and vetted directly by Hemisphere personnel and applying several layers of both In-House and 3rd party Quality Control, we can ensure that the products you receive from us will always be of the highest quality at the most competitive pricing possible regardless of the applied sourcing strategy. Strategically located warehouse and fulfillment locations on the West Coast and in the Mid-West, with targeted distribution and installation services available worldwide. Hemisphere can manage the entire roll out or work directly with your carrier network for flawless executions regardless of scale, scope, or geographical location. Some of our latest brand engagements. 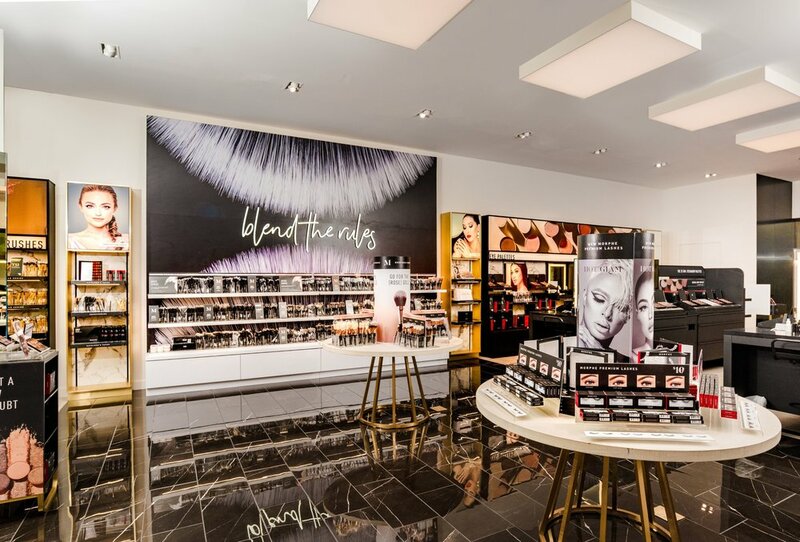 Morphe Cosmetics teamed up with Hemisphere for it’s first national push into Brick and Mortar retail. 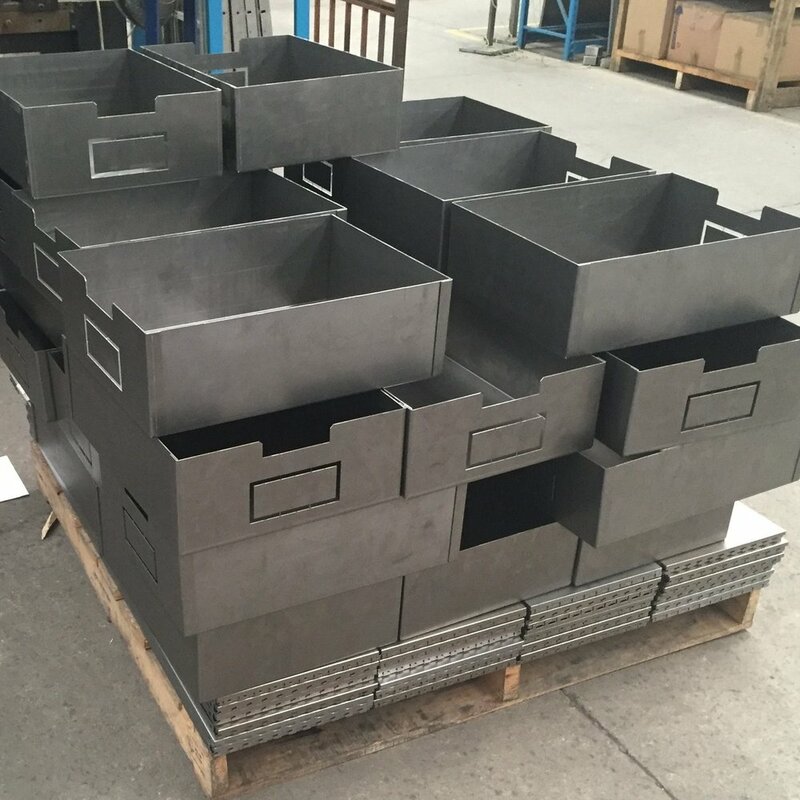 Bringing their aesthetic ambitions to our design & engineering team was a match made in heaven and our in-house fabrication capabilities allowed us to bring the dream to reality. Hemisphere produced all perimeter wall/island/cash desk fixtures and acrylic in these spaces. Brandbox teamed up with Hemisphere for an awesome holiday pop-up in Tysons Virginia at the Galleria Shopping Center. Having to showcase multiple brands and their products inside of a freestanding space was no small task and the result was nothing short of eye-catching. Furniture mounted on vertical walls, way finding sheep, dinosaurs with plants growing out of them, and customer charging stations.. what a quirky and fun space! Hemisphere worked with Vans to create this takeover experience, see ya Converse. There are back walls that flip-up revealing extra inventory, a custom interactive podium, and tiled monitors driven by a hidden media player. If you’re only as strong as your weakest link, damn.. I feel sorry for that guy down the street.